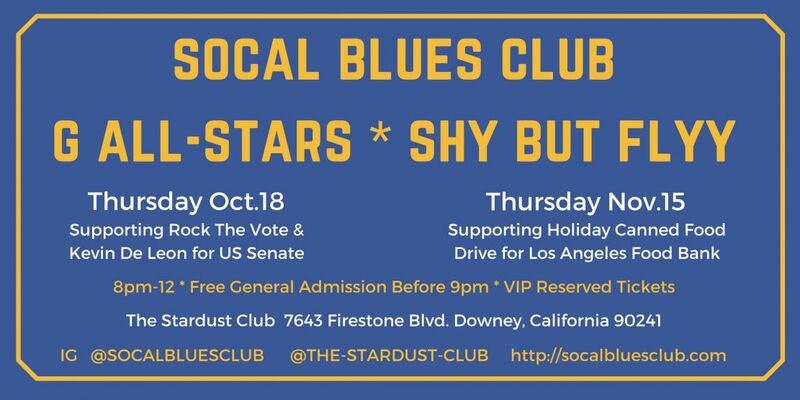 LOS ANGELES - Oct. 8, 2018 - PRLog -- SoCal Blues Club Series announced 2 new shows to the 2018 Fall Schedule. Produced by SoCal Event Network, the live music event supporting tie-ins include Rock The Vote, Kevin De Leon US Senate Campaign & Los Angeles Regional Food Bank. Supporting Holiday Canned Food Drive for Los Angeles Regional Food Bank. Rock the Vote is a nonpartisan nonprofit dedicated to building the political power of young people. In 1990, music executives founded Rock the Vote in response to censorship of hip-hop and rap artists. Our first partnership, with MTV, helped us to promote the message that "Censorship is Un-American" and to engage young people across the country in fighting back.For over 25 years, Rock the Vote has revolutionized the way we use pop culture, music, art, and technology to engage young people in politics and build our collective power. We've registered and turned out millions of young voters on campuses, in communities, and online. We've successfully fought for — and defended — voting rights and increased access to democracy. We've raised awareness and campaigned for issues that impact the lives of young people. We've pioneered innovative ways to make registration and voting work for our generation,and built open-source tech to empower other organizations. The first Latino elected President pro Tempore in more than 130 years, Senator Kevin de León (D-Los Angeles) truly embodies the California Dream.Born to the very humblest of beginnings and confronted with a multitude of obstacles, Kevin emerged to become a civil rights organizer, and an accomplished state lawmaker. His mother, Carmen, a housekeeper and a caregiver for the elderly, taught him both the nobility of a hard day's work and our shared obligation to build a brighter future for the next generation. After years as an educator teaching U.S. citizenship courses, Kevin became a community organizer helping plan the largest civil rights march in California history against Proposition 187. Now, on the 20th anniversary of Proposition 187's passage, his Senate Bill 396 erases this unconstitutional stain from California law. Following years as an advocate for teachers and public schools with the National Education Association and California Teachers Association, Kevin de León ran for a seat in the California state legislature and won. In the Legislature, Kevin is known nationally for trailblazing legislation such as authoring the 'Yes Means Yes' bill to protect college students against violence and sexual abuse. His efforts to provide retirement security to the millions of low-income workers has been called "a model for addressing a national problem" by The New York Times. He authored the first legislation in the nation to prevent the unnecessary separation of families — protecting against parental rights from being terminated because of immigration status. He also fought to ensure revenue from California's landmark law to reduce greenhouse gas emissions be directed towards air, water and other environmental quality projects in low-income neighborhoods. Kevin is the Leader of the California Senate, representing the diverse people of Los Angeles and California. He is one of two final candidates for the United States Senate in the 2018 election cycle, earning key endorsements including the California Democratic Party and many Labor, Environmental & Progressive Organizations. SoCal Event Network (SEN) develops, produces and promotes branded live music events for corporate clients, festivals, parties & clubs. The SEN team has over four decades of successful event experience, in a range of genres, in US and International venues. We develop event platforms that enable Sponsor & Fundraiser Partners to effectively reach target audiences.